The new version of Spectacles does bring in some improvements like a thinner frame and the ability to snap underwater, but even if you're not a regular Snapchat user, the ability to export your media properly to other apps is a huge bonus. Update: Snapchat's latest update now allows Snaps to be exported without the 'fisheye' look, which was our biggest complaint in the original review. We've updated our review with our experiences using the latest version of Snapchat. When Snap Inc first debuted Snapchat Spectacles, lovers of the social networking app went into total meltdown. Here was a device that would let them share their lives with the world from an exciting new perspective, akin to having a GoPro strapped to your face. The idea did have some merit, but its execution was shockingly poor. The original Spectacles were initially only available in the US, and could only be purchased from a vending machine that was constantly on the move to different locations. Snap Inc. hoped that this limited availability would make the device even more sought after, and for a time it did work, with people queuing up for over an hour to try and get their hands on a pair. Despite the initial buzz, the hype around Spectacles eventually quietened down, and the company revealed that it only sold 220,000 pairs. Hoping to correct some of the mistakes from the first product launch, Spectacles are back with a few upgrades thrown in, though there’s still precious little here to convince you to pick up a pair. Unlike the launch of the original Snapchat Spectacles, Snap is selling the glasses from day one online. If you live in the US, you can buy the glasses directly from Amazon for $149.99 while those in the UK have to pay a little more at £149.99 (about AU$270). There's no word on when the glasses will be on sale in Australia, but you can buy them in a variety of other markets in Europe on the official Snap website. It's currently unclear if the Snapbot vending machine method of bringing the glasses to different countries will happen or not. 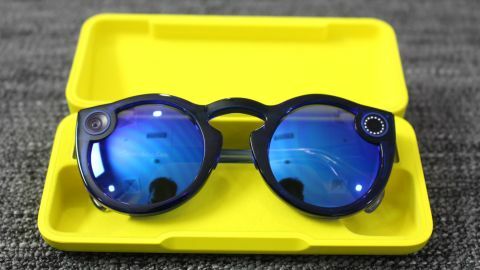 The new glasses were announced in April 2018, and soon after the company was selling the new Snapchat Spectacles online - or at least for those in the US. You can choose from three frame colors – Onyx Midnight, Ruby Daybreak and Sapphire, with a choice of two kinds of lenses for each frame. There are three frames Onyx, Ruby and Sapphire - and 2 lens styles - Moonlight and Eclipse (for Onyx) Midnight and Twilight (for Sapphire), and Daybreak and Sunset (for Ruby). For US customers the company also has a special partnership with Lensabl, which lets you order Spectacles with prescription lenses. The first-gen Spectacles came in some rather bright colors, making them look almost comical when wearing them anywhere other than the beach or poolside. The new version features much more subdued colors, so they actually look like normal sunglasses. Gone is the yellow ring around the camera lens, which was an unusual quirk of the previous model. The sides of the frames are slightly smaller as well, so overall things have been shrunk down a bit to make everything a fraction lighter. The hard plastic frame feels quite sturdy, so it should survive an accidental fall or two. The one thing we didn’t like about the frames is that they feel a bit too rigid on your nose, so after about half an hour of wearing the Spectacles, we were left with two rather prominent circular marks on our nose. You still have the camera on the right side and an LED status ring on the left side, as well as a small LED light on the inside that acts as a cue when the device is recording and when a snap is about to end. It’s hard to see this small LED when outdoors or in bright light, so you have to just hope that you’ve recorded your Snap properly. People will still always know when you’re recording a video or taking a photo since the front LED ring lights up every time and can’t be disabled. A small button rests on the top-left side of the frame, which you can press once to start recording a 10-second clip, or press two or three more times to record up to 30 seconds of video. Holding down the button for two seconds will take a photo, and everything is stored directly on the Spectacles. The bright-yellow charging case has also shrunk a bit, making it much more portable to chuck in your bag. It can provide up to four full charges for your Spectacles, and a handy ring light lets you know how much charge is left in your case. You can also attach the USB charging cable directly to your Spectacles should you not have your case handy. One of the biggest selling points for the new Spectacles is that they’re water resistant, so running around in the rain or a quick splash in the pool should result in some great content for your Snapchat. The Spectacles now also support taking photos, which is something the original Spectacles couldn’t do initially, but is now achievable via a quick software update. Camera quality has been slightly improved, with photos being captured at 1642x1642 resolution, and video at 1216x1216 pixels. Dual microphones also result in better audio, with everything from background sounds to voices coming through clearly. Low-light capturing is still quite terrible – at least with your phone you can turn on your flash to brighten things up. Setting up Spectacles is really easy, and can be done in a matter of minutes. Just download Snapchat, turn on Bluetooth, and hold down the capture button for seven seconds on your Spectacles. Once paired, any new snaps you take with your Spectacles will be instantly downloaded to your Snapchat once you launch the app. You can then review what you’ve captured, and post to your Snapchat accordingly. The beauty of Spectacles is that you don’t need have your phone with you in order to capture content. You can just go for a walk or a quick swim, capture some photos or video, and then just come back to your phone when you’re ready to upload everything. Transferring content to your phone with the original Spectacles was a really slow and troublesome affair, but thankfully this has been greatly improved. Content copies over in less than three seconds per snap, thanks to improvements in the Spectacle's Wi-Fi connection. It makes the whole experience so much easier, which is obviously a boon if you’re a heavy Spectacles user. We did however, run into a few connection issues with Spectacles, something that did plague the original model as well. There were times where Snapchat couldn’t see our paired Spectacles, even when we repeatedly relaunched the app or toggled Bluetooth on and off. When paired successfully the Spectacles work flawlessly, but there are those rare moments where you’ll be left puzzled as to why your phone can’t connect to them. You can post snaps taken with Spectacles to your story, and viewers can then rotate their phone to view either a vertical or horizontal view of what you’ve posted. Until recently, any content exported from Spectacles would be saved on a white background with a fisheye look to it. So sending a friend a great photo you just took via WhatsApp would result in a rather poor viewing experience versus sending it privately via Snapchat. Thankfully, Snap released an update to the app which now allows you to properly export content to other apps without the fisheye look. The update now includes a 'Square' (1160x1160 pixels) or 'Widescreen' (1312x984 pixels) format, which removes the fisheye look, but doesn't let you choose how you want the image or video to be cropped. It takes your Snap (regardless of what orientation your phone is in) and crops it to the center, so you need to make sure that whatever you're capturing is always centered if you intend to export it later. Widescreen exports tend to include a bit more detail in your exported image, so we prefer to export in this format and then further adjust or crop in other apps if necessary. If you were thinking to export Snaps in full 'portrait' mode to upload to your Instagram story for example, then you're out of luck. Snap is less likely to allow this method of exporting as it would certainly drive people to just use Spectacles as a capture device, and not actually post anything to their Snapchat stories. Your Spectacles will warn you when it’s time for a recharge, and the Snapchat app also lets you keep an eye on battery levels. We were able to get almost a week of usage out of them, keeping in mind this is mostly with taking photos rather than video. Heavier users will probably get a couple of days of usage, and the handy charging case will help keep things topped up. There’s no denying the appeal of Spectacles for that true first-person view when capturing content for Snapchat. There is a sense of freedom with being able to easily capture photos and video without having to tug out your phone every time. The newfound ability to export content properly outside of Snapchat is a definite plus point, and helps to make Spectacles a bit more appealing. Apart from being water-resistant and a slight bump in resolution, there’s not much else that would convince a first-gen Spectacles user to splurge on an updated pair. For anyone who’s never used Spectacles before, they offer a fun and intuitive way to capture the world around you, but having said that, you’d probably get a better experience from a budget action camera instead.